Everyone seems to have a signature dish that they are asked to bring to every function they’re invited too. 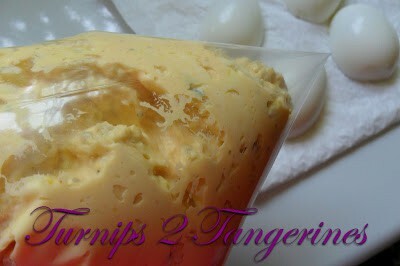 Mine signature dish “favorite deviled eggs.” Some 40 years later and I’m still making them. The recipe has changed somewhat, with the addition of spices, cheese etc. but all in all the recipe has remained the same. Every one has a signature dish. That special dish that your known for. A special dish only you make and everyone raves about. The special dish your asked to bring to every party or family get together. Your signature dish is that special dish that has your name stamped on it. My sister Mary can’t go to any party without bringing her carrot cake, my DIL Kim always is asked to bring something sweet, my MIL was famous for her French onion chip dip and in my SIL Lynn’s family, no get together is complete with their pistachio dessert. What is Your Signature Dish?? My signature dip is Deviled Eggs. Actually over the years I’ve had several signature dishes; Lemon Meringue Pie, Bean Dip and Layered Taco Dip. Even though I’m asked to bring the other signature dishes, they’re always in addition too my “signature deviled eggs.” I have been making deviled eggs for over 40 years. I started making deviled eggs, way back when I was first married. 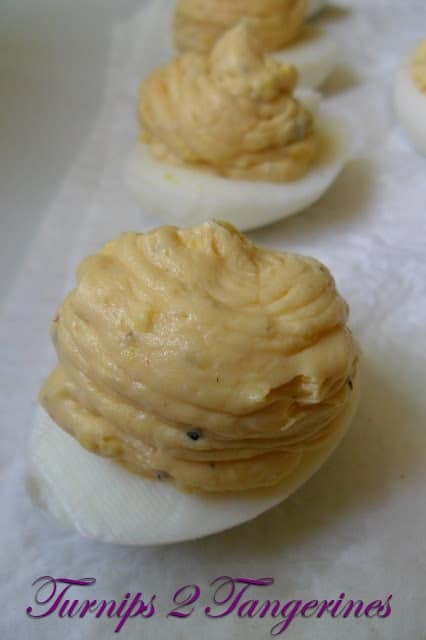 Money was tight back then and making deviled eggs was an inexpensive “dish to pass.” Forty years later, I’m still asked to bring deviled eggs to parties, get togethers and the like and I still do. I jumped for joy when “domed” deviled egg trays could be purchased at the “Super Centers” for literally a few bucks. Life is good in the deviled egg tray department. The first covered deviled egg tray that I owned was one I purchased from Tupperware, many moons ago. It was expensive at $12.00 way back when. I still have that “harvest gold” egg tray with the off-white cover. Since then I’ve added three more trays and can now transport several dozen deviled eggs, carefully. 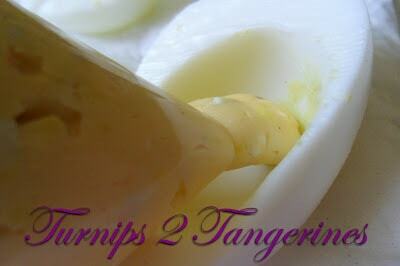 Peel hard-boiled eggs. Slice eggs in half, wiping knife after each slice. Carefully scoop out egg yolks, put egg yolks in a small bowl, keep egg white intact. 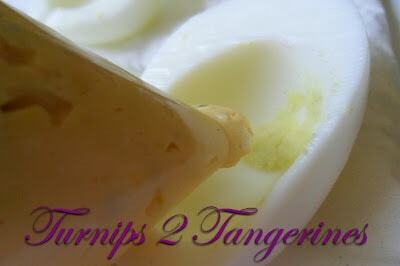 Turn egg white halves cut side down on paper towel. Meanwhile, cream together cream cheese, cheese wedges and mayo. Beat on medium high with an electric mixer until creamy. Add egg yolks to creamed mixture, beat until smooth. Fold in crumbled bleu cheese or feta cheese, beat until creamy. Add hot sauce, salt, pepper and garlic powder, beat together. 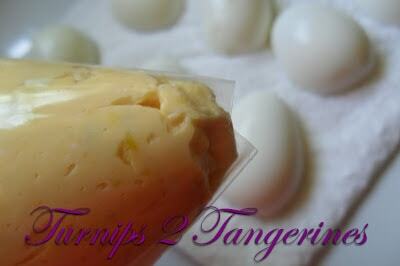 Spoon egg mixture into a large ziplock baggie or pastry bag. Squeeze egg mixture to one corner of baggie. Snip off one corner of baggie with a scissors, make sure to snip off a small part of the tip but large enough for the cheese to squeeze through. 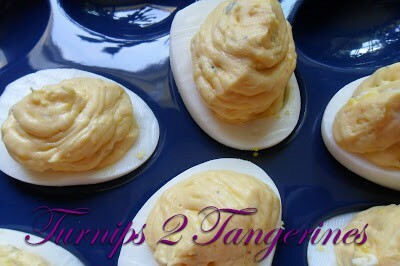 Turn egg whites over and squeeze filling into shells, fill all the egg white shells and place on egg tray. 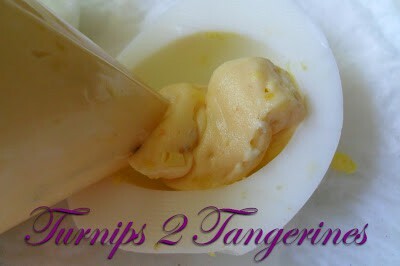 The photos below show how to use a plastic baggie to fill the egg white shells with the egg yolk mixture. 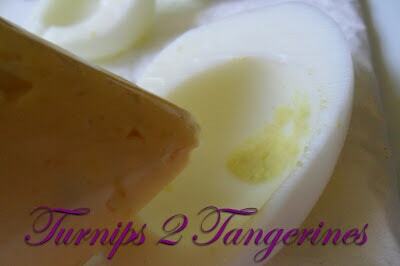 Place egg yolk mixture in a large plastic baggie. Gather the open end of the baggie and twist, forcing the filling mixture to one end of the baggie. Snip off the pointed corner of the baggie. Continue to force the filling down and out through the hole, while applying pressure to the bag. Stop occasionally to twist the opposite end. Continue until all egg whites are filled. I LOVE deviled eggs. I make them less often than I would like, but never have I thought to include bleu cheese. These sound delicious. I think I need to make some of these today! 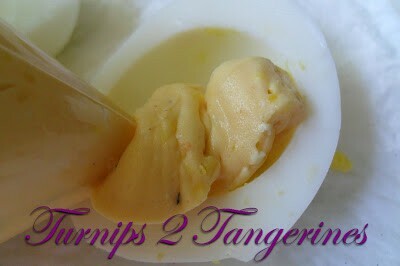 Hi Lynn, your deviled eggs look inviting, very nice appetizer. I love eggs regardless any recipes. Thanks for sharing your recipe. Hi Miz Helen~ Thanks for stopping and I will see you again on Thursday! Yummy in my tummy. Stopping by from Happy Aloha Friday! and following. I just ate deviled eggs today, I love them 🙂 I've never tried them with blue cheese, I am so going to try your recipe since I am a big blue cheese fan! I love when people bring deviled eggs to parties! I really should attempt to make some myself.